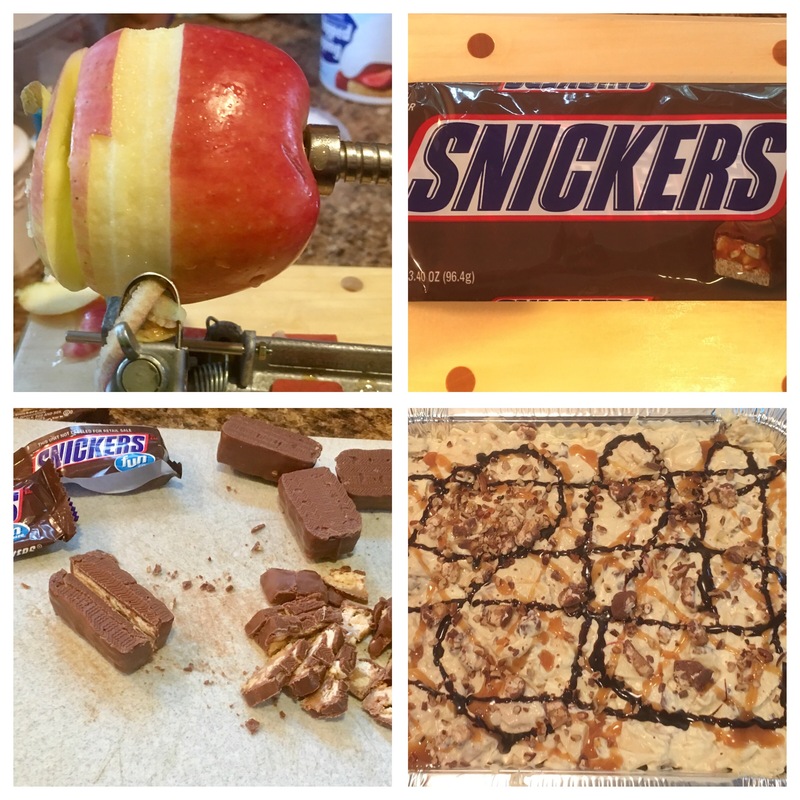 I received a text message from my niece this morning asking me for the recipe for my Caramel Apple Snickers Dessert. I immediately came to my blog to pull it up and realized I had never typed it up! I took all of the pictures the last time I made it, but forgot to write the recipe. I needed to correct this oversight immediately! Now, yes, the title is misleading, it isn’t really a salad, it’s a dessert, but let’s face it, we all feel better calling it a salad. I will admit, I didn’t come up with the recipe, I found it a while ago, back before I was writing a blog, so I didn’t save the information of where I found it or who had authored it. I have made some changes to it to suit my preferences and wanted to share it with everyone. 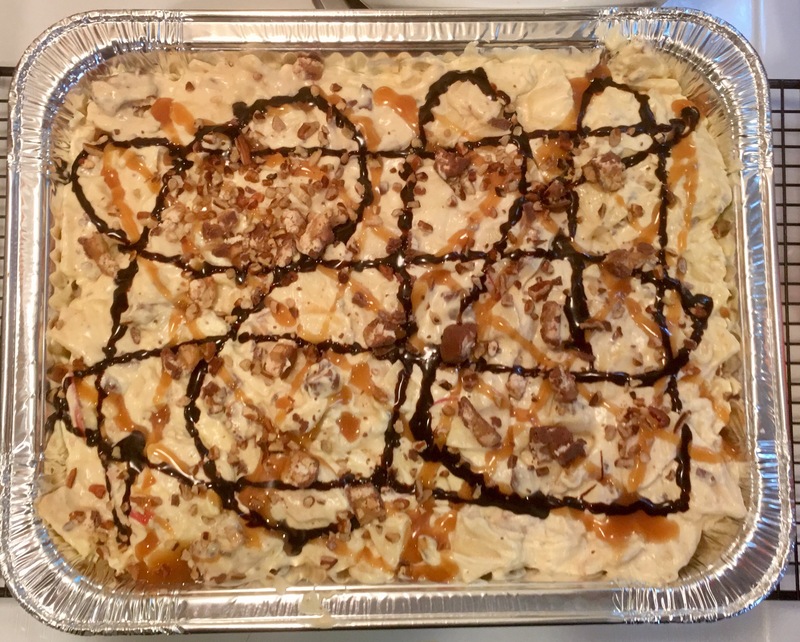 Because it is a nice cool dessert, it makes a nice Fourth of July celebration dish but can be enjoyed all year long. For my dessert, I chose to use Ambrosia Apples. You can use any type of apple you want, but I chose these because they are a low acid apple, so more people can enjoy them, they tend to be more sweet, than tart, and they blend well with the other ingredients. If you want a tarter apple, Granny Smith apples may be better for you. As some of you may recall from my pasta salad recipe, I like to use the half size disposable aluminum steam pans. I usually buy the pans and lids from Sam’s Club and use them throughout the year. I never have to worry about remembering my pan after a party. Depending on the size pan you are using, you can adjust the apples and the snickers to match. Before I begin to mix everything, I start by cutting up the apples and the Snicker’s bars. 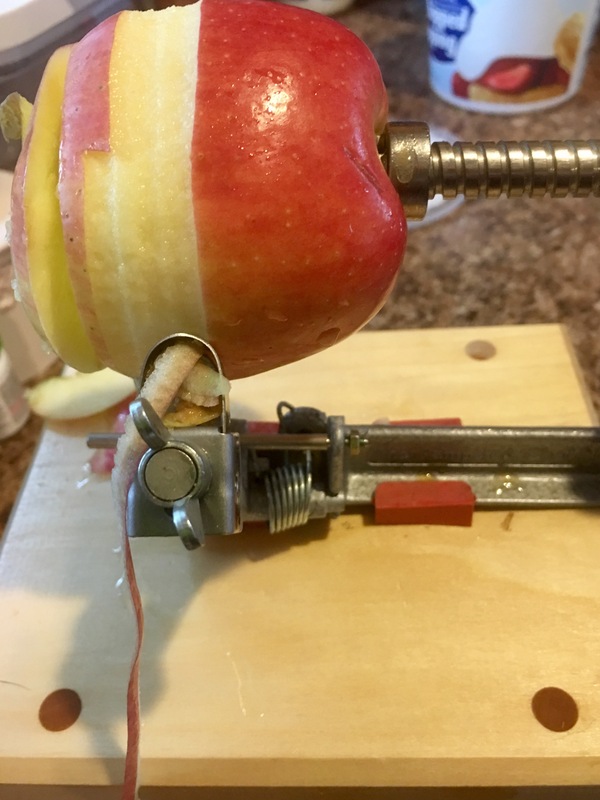 To speed up the apples, I use my Pampered Chef Apple Peeler Corer Slicer. It works amazingly well, and then I just have to cut them into a little bit smaller pieces. I take the peeling off because it’s easier for my mom to eat that way, but if you don’t have anyone with those issues, feel free to leave the peelings on. 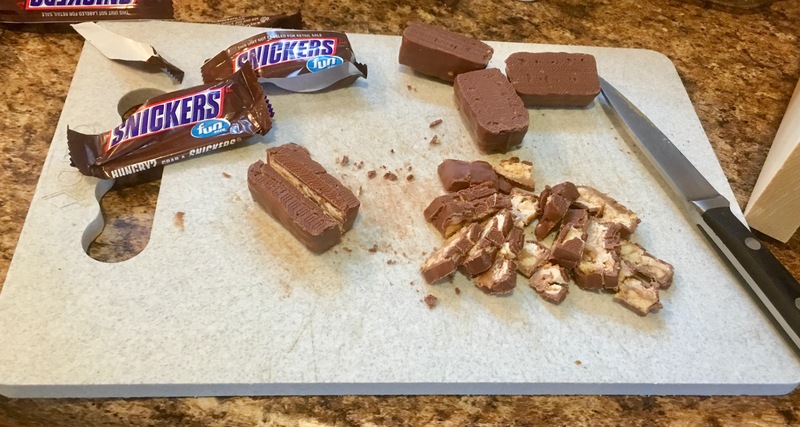 For the Snickers bars, I found it easiest to flip them over, cut down the middle, then cut along the bar in small, bite size pieces. It is important to make sure you start with a sharp knife. I’ve tried it before with a knife I didn’t sharpen, and it was a mess. When I sharpen the knife right before starting, it cuts through the candy bar very nicely. To start putting it all together, I make a small pattern of the caramel topping and chocolate topping on the bottom of the pan. I know no one sees it, but I think it helps with the flavors being better mixed. 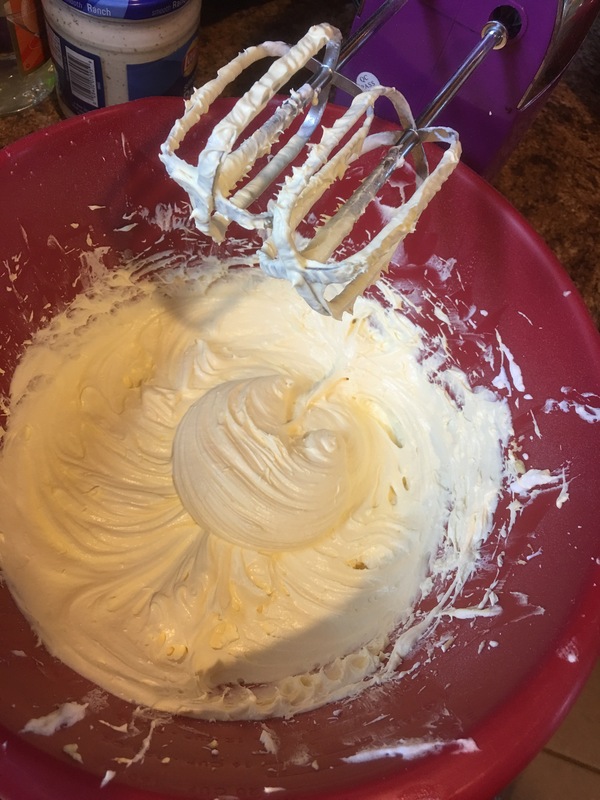 In a mixing bowl, combine the milk and the pudding mix. Slowly blend in the cool whip. Once you have it at a nice consistency, fold in the apples and the snickers pieces. Once they are all mixed well together, spread the mixture out into the pan. If you’re like me, I try to smooth it all out, so it’s flat and even, but since it’s a “salad” it doesn’t matter how it looks in the pan. Well yeah, to me, it does! Drizzle the caramel sauce and the chocolate sauce over the top. You can sprinkle some pecans on the top if you want as well. I know I know, with the Snicker’s having peanuts, why would you add pecans….to that I say….why WOULDN’T you add pecans? Pecans ALWAYS go with chocolate, caramel, and apples! Chill for at least an hour before serving. If you’re taking it to a party, you might want to consider taking another empty pan, put ice in the bottom, and let the salad sit on the ice to keep cold until it is served.